If you’re looking for cheap wedding flowers, choosing blooms that are in season is just one way to save on your wedding flowers – and help the environment too! If you feel that you absolutely must have a certain bloom in your bouquet, then have it! 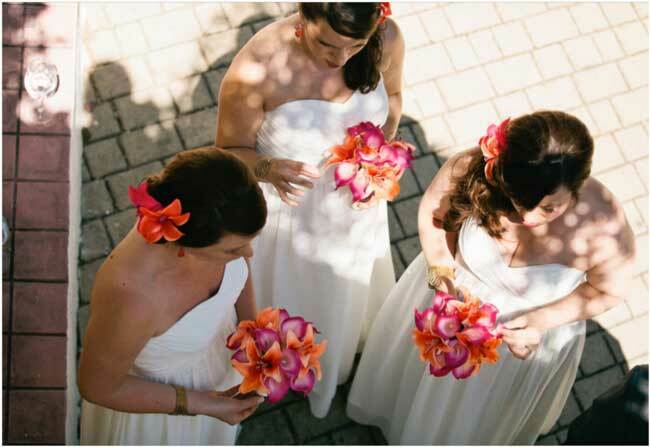 Try to balance the cost elsewhere, for example with your bridesmaids’ flowers. Just because you have peonies in your bouquet doesn’t mean your bridesmaids need them too. Perhaps you could substitute them for David Austin roses to keep your costs down? Ahead of the big day, attend a flower arranging workshop with your mum or bridesmaids. It could be part of your hen party or just a fun, girlie day. 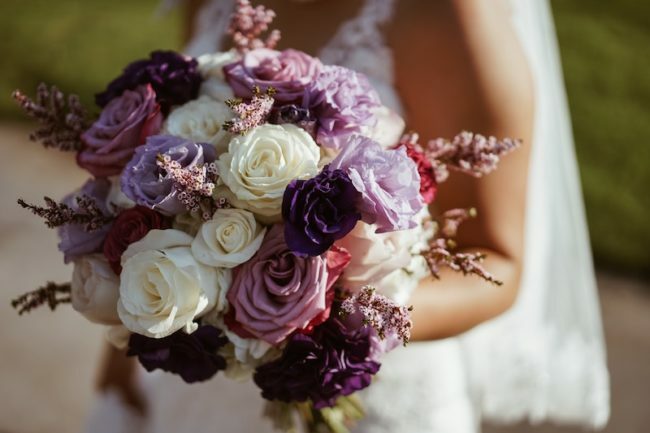 Then the day before the wedding, head to your nearest flower market and choose the blooms you want – early in the morning is best for lots of choice and to get the flowers when they are most fresh. Arrange your table centres yourselves ready to take to the venue in the morning. Make sure you keep the flowers in water and place them somewhere cool over night. 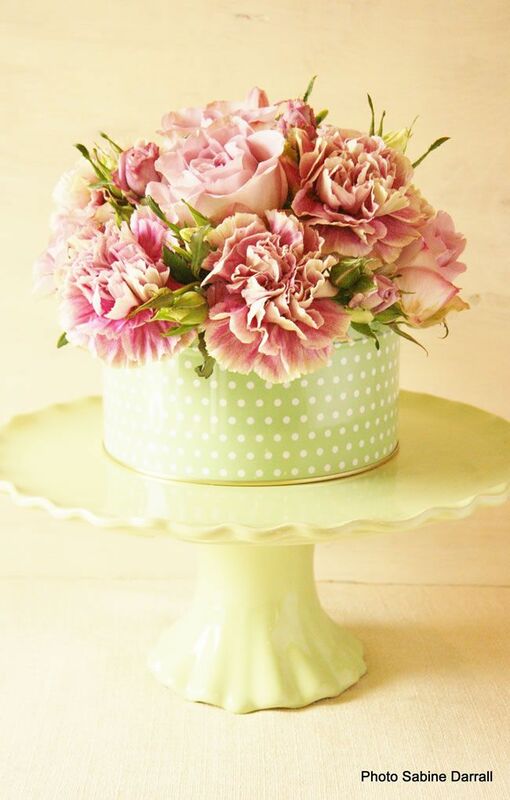 Opt for flowers that have a large head, like hydrangeas, peonies or dahlias. This will allow your florist to create a full bouquet using fewer stems – saving those all important pennies. 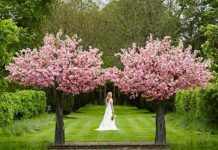 If you are having your service at one venue and then moving to a different venue for your wedding reception, allocate someone from your wedding party to co-ordinate moving the flowers with you. The arrangements at the end of the aisle, venue’s entrance and from chairs can all be re-purposed at your reception venue, saving you from buying the blooms all over again. 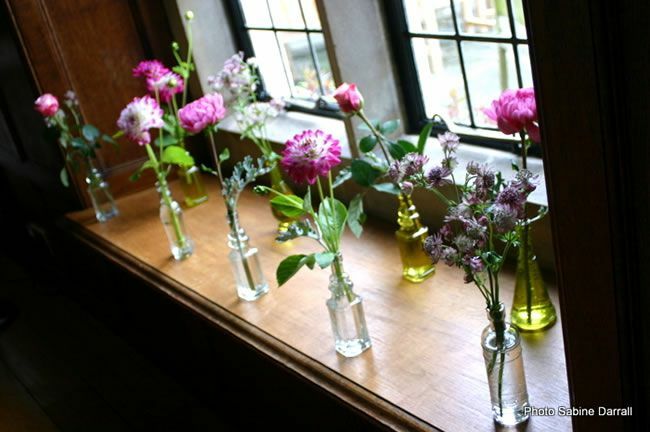 While all of the planning is taking place you could grow your own flowers and pick them the day before the wedding to create your table arrangements. Just make sure you’ve had a practise, been to a workshop and feel con dent. Don’t risk creating your own bouquet though – leave that to the professionals. Consider how high up on the list of priorities they are and how much you can actually afford, then be up- front with your florist about your budget. 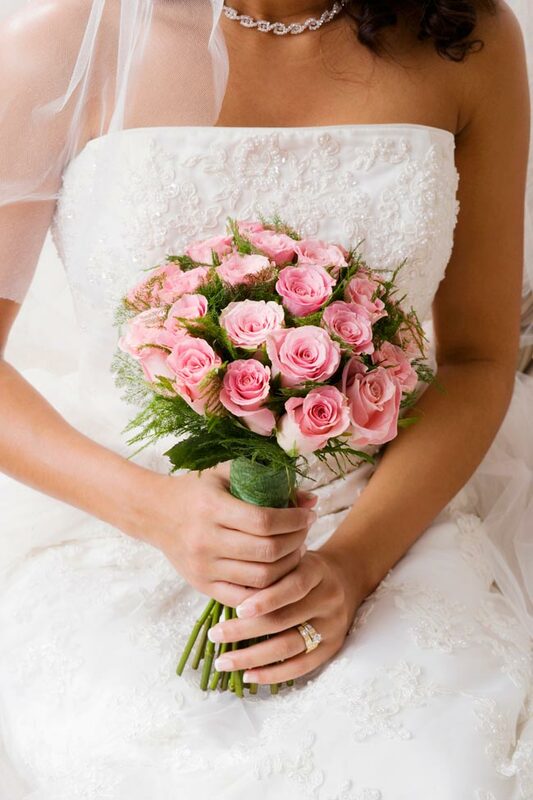 You might want to choose your wedding flowers by season but if you might want peonies and they’re not in season, your florist will have ideas for similar looking blooms to create the same effect. 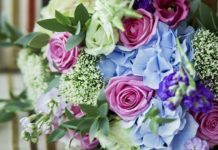 Give suggestions about the colours and shape of the flowers you want and see what your florist suggests within your budget. You can fine tune things from there. If you are decorating the ceiling or having a flower wall for people to have photographs in front of, then chances are no one will look at them too closely. This makes it the perfect opportunity to opt for artificial wedding flowers and greenery instead. This means your florist can buy in bulk and can pass their savings onto you. The time your florist takes to source the blooms will also be reduced, which may favourably impact on the price too. Fanciful urns will obviously cost a lot more than decorated jam jars. You could arrange miniature potted plants or herbs along your aisle or around your venue to fill the room with colour and fragrance, before taking them home to keep or giving them out as gifts at the end of the day. 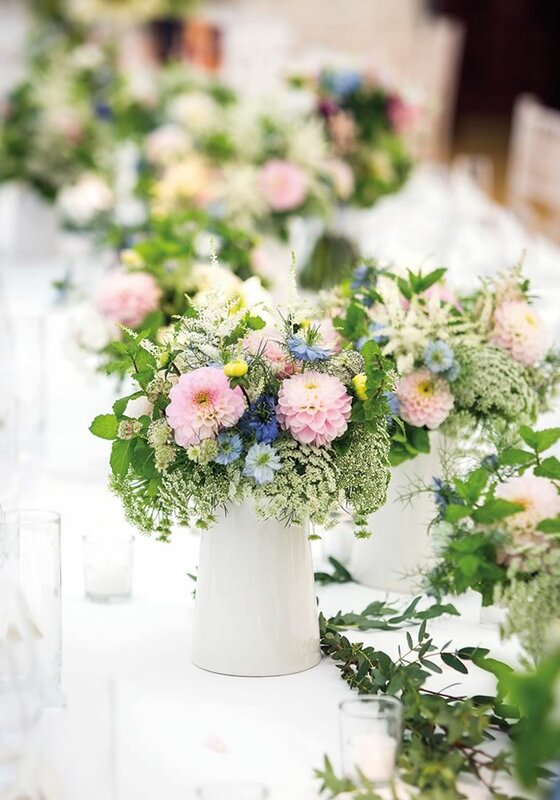 If you’re looking for the biggest flower trends of the year, have your florist fill out your bouquet with leafy foliage and sprigs of gypsophila. Opt for foliage intertwined with fairy lights to decorate beams at your venue, or hoops of greenery to hang behind your wedding cake – the opportunities are endless. Choose an area, like the end of the aisle, to really go to town on and then leave other areas to be more understated. Having half-hearted flowers dotted around will have less of an effect than a couple of highly decorated, WOW areas. Which would you remember? What are the best cheap wedding flowers? 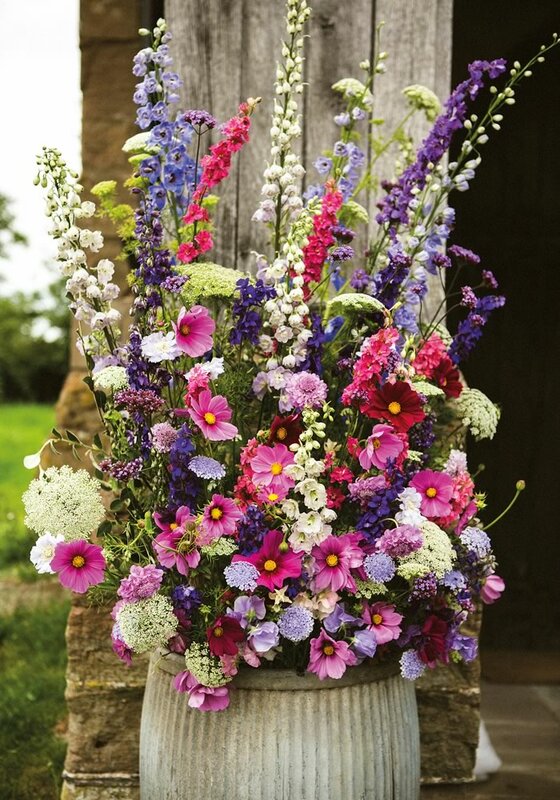 With spring in the air, our current favourite flower is blossom – it’s simple, beautiful and natural. 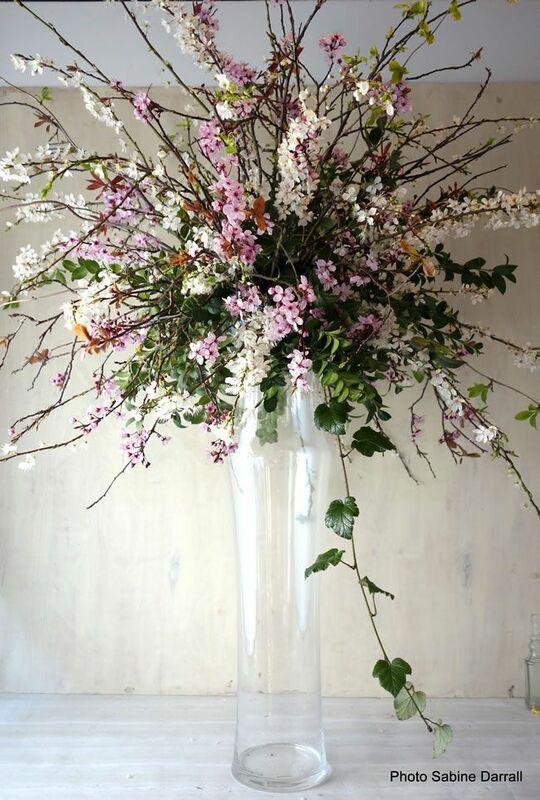 Used alone, blossom is the ideal way to create large displays that bring the orchard indoors. Gypsophila is a budget wedding favourite! 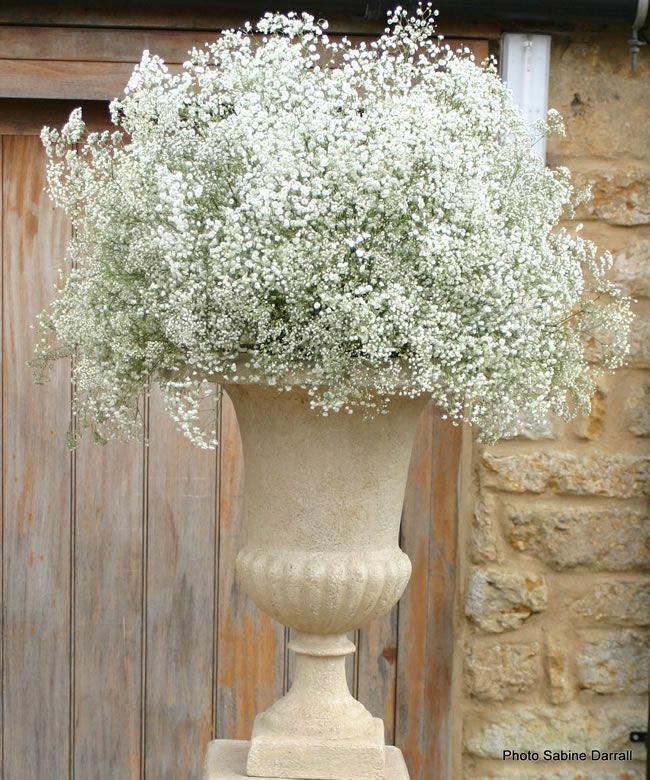 Its delicate, cloud-like flowers look wonderful massed in large arrangements, which makes gypsophila perfect for creating impact without breaking the bank. Spring flowers like narcissi, daffodils and tulips are good value, and may even be growing in your garden! The table centre of four bunches of narcissi arranged in a paper lampshade above has a wonderful scent and cost less than £10 to make. 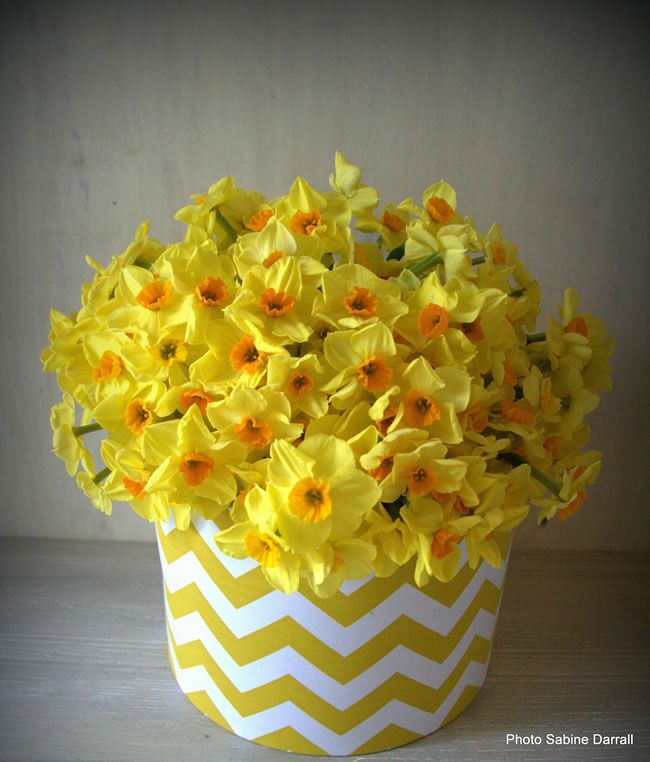 Look for narcissi wedding flowers from the Scilly isles and support our British growers. When it comes to wedding flowers, less is sometimes more. Exotic flowers like orchids can be expensive, but a few blooms arranged in a more contemporary way doesn’t cost the earth and makes a dramatic statement. 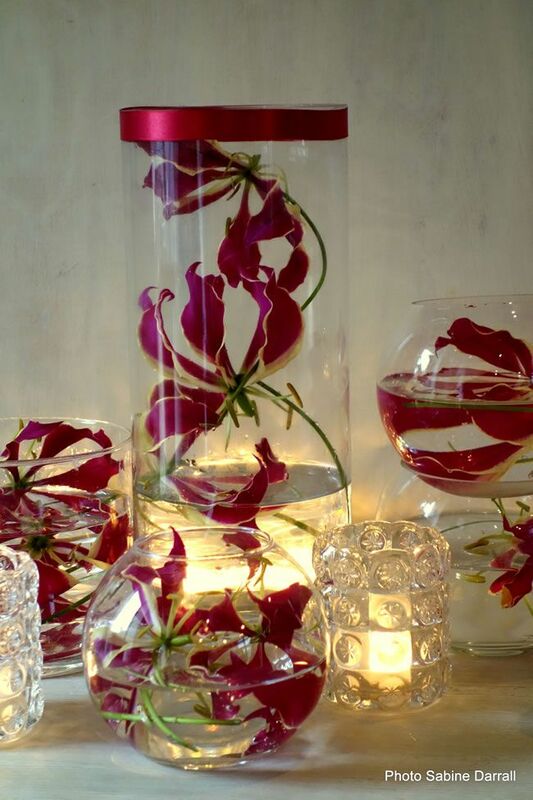 Above are ten stems of Gloriosa lily in a selection of water-filled vases. Dahlias are making a massive comeback, and the good news is that these economical blooms come in every shape and colour imaginable, which means you’re sure to find a flower to match your wedding theme. Look for local growers in your area via the Flowers from the Farm network. The carnation is another wedding flower that’s becoming popular again. With many new varieties on the market, the humble carnation is definitely worth a second look, as its both robust and budget friendly – plus it can give you the full, fluffy look of garden roses for a fraction of the price! For winter weddings, a massive bunch of twigs or bare branches with a few flowers and hanging tea lights attached looks wonderful. 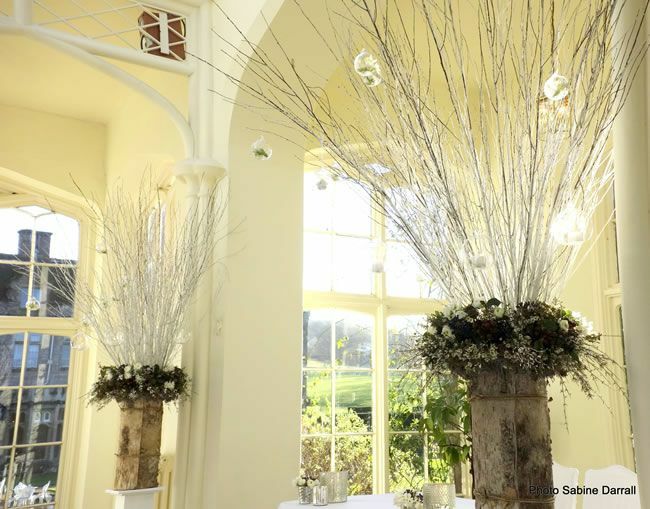 You can leave the branches naked, or spray them gold or silver for a metallic theme wedding – plus the great thing is that twigs won’t wilt, so they can be used again!